All animations have to do with the black-and-white film in which the monster has to be defeated. And with that, the animations look good. What's more, the animations have been kept simple. Therefore, it isn't hard to keep track of what's going on on your reels. With the original sound effects from the movie, this slot definitely sounds great but most players will be more interested in the free spins and the various different wilds that make this game so exciting. Most people playing this slot won't even know the film. 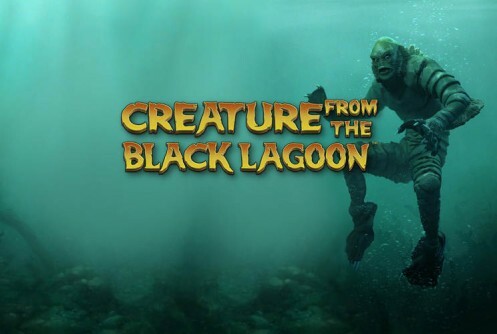 In order to produce Creature from the Black Lagoon, software developer Net Entertainment has collaborated with Universal in order to use the animations and sound effects in an attempt to make a very interesting slot. And they succeeded in doing so royally. Even for people who don’t have a single clue what Creature from the Black Lagoon is, it still is a very fun slot in which you have to save Kay. With the underwater fight during free spins and the various different wild symbols, Creature from the Black Lagoon definitely is an exciting game in which wins can really add up. How to play Creature from the Black Lagoon? All animations have to do with the black-and-white film in which the monster has to be defeated. And with that, the animations look good. What’s more, the animations have been kept simple. Therefore, it isn’t hard to keep track of what’s going on on your reels. With the original sound effects from the movie, this slot definitely sounds great but most players will be more interested in the free spins and the various different wilds that make this game so exciting. Most people playing this slot won’t even know the film. Before you enter free spins, you will be shown an introduction video in which everything you need to know about free spins will be explained. The monster has captured Kay and you have to defeat the monster. In order to do this, you will have to watch the fifth reel. When a red dot (like one from a riflescope) lands on the fifth reel, the monster will get shot. Because all wilds stay on the reels for one extra spin after they have landed the first time, during both regular and free spins, winning an extra wild is very interesting. You will also receive a free re-spin and if you have multiple wilds, that should definitely lead to wins. During regular spins, this is even truer. During regular spins, wild symbols stick around until there is a spin that doesn’t add any new symbols. So, it will happen frequently that you have more than two wilds, significantly increasing your chances of winning. Creature from the Black Lagoon makes use of just 20 pay lines. That’s a little fewer than on the average slot but the many wilds make up for it. That is, you will frequently get to re-spin, which basically equals a free spin. During free spins, you can unlock extra wilds, including a wild expanding over the entire reel. This makes re-spins really interesting. The only disadvantage is that you’re going to need these re-spins in order to defeat the monster. Netent really has given you a hard task. The slot also has an autoplay function which you can configure just the way you want. You can, of course, also alter your total wager by altering the coin value and the number of coins per pay line.